We want you to enjoy your B G Fencing Ltd Christmas tree for as long as possible. Follow our simple tips on how to look after it and be happy knowing you can have a magical Christmas absent of tree woes. Cover the floor or table where the tree will be placed to help protect from water spillages and stains from wooden base. TOP TIP – Keep your tree outside in water for as long as possible before bringing in to decorate, this will help to reduce drooping and needledrop. Mount your tree as soon as possible after cutting the base. Place your tree in a container of water that is replenished on a regular basis. You can buy special tree stands which provide watering space. If using wooden block submerge block in some water using a bucket or tray. Make sure your tree is straight. It is a good idea for at least two people to put up your tree, one holding it stable while the other fixes the base. Always stand back to check that the tree is straight before you get busy decorating. TOP TIP – If your tree is slightly too big for your selected space, it can always be trimmed down to size. Finally, decorate and admire your B. G. Fencing Ltd Cut Christmas tree. 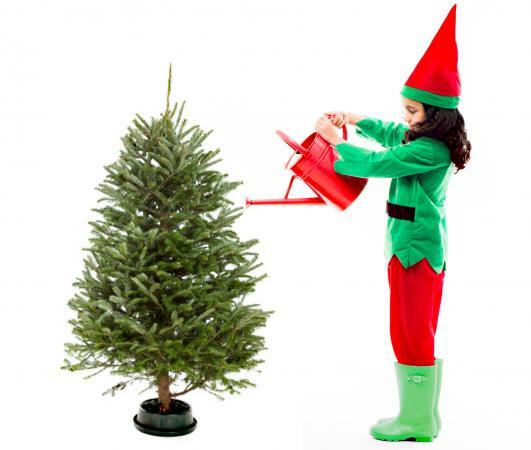 Don’t forget to water your tree frequently.